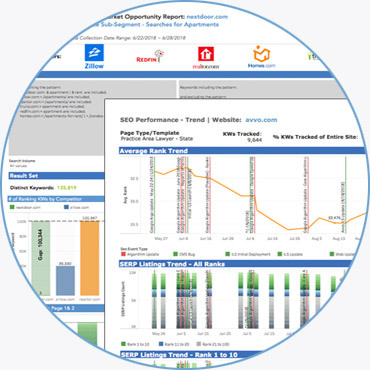 Macrotrend SEARCH INTELLIGENCE™ includes proprietary reports and data visualizations designed specifically for Macro SEO that enable us to define and value search market segments. SEARCH INTELLIGENCE is a data ingestion and processing technology designed to import millions of market and internal business data points for our clients and their top competitors on a weekly basis. This unique capability to capture the big data picture is then visualized into Market Opportunity, Competitive, and Sub-Segment reports. These reports are specifically designed to identify the most valuable new opportunities that you should act on. MMG can use SEARCH INTELLIGENCE as a roadmap to design an overall strategy and tap into this new found opportunity leveraging MMG’s suite of products.